Jewish wedding bands & rings play a very important part in the traditional Jewish wedding ceremony, and selecting the right ring is imperative. Orthodox Jewish weddings have many traditions and laws regarding the wedding ceremony and wedding bands, though other Jewish denominations may relax some of these laws. Regardless of how traditional the wedding ceremony is to be, there are some requirements for Jewish wedding bands & rings. Representing the everlasting bond between the couple, Jewish wedding bands must be solid uninterrupted gold without jewels or other embellishments. Engravings are allowed, but there should not be any holes or any breaks in the band itself because it is a symbol of the everlasting bond between the couple. Traditionally, Jewish wedding bands & rings were simple solid gold without any engraving, but in recent years, more Jewish couples have Hebrew inscriptions engraved on their wedding bands. In Jewish tradition, the wedding band symbolized the physical consecration of the bond between man and wife. According to Jewish law, the ring must be the bridegroom’s property at the start of the wedding ceremony. Traditionally, only the bridegroom gave a ring to the bride, but most couples now exchange rings. In the Jewish marriage ceremony, the groom places the ring on the bride’s right index finger, though she usually moves it to the traditional left hand ring finger after the ceremony. The ring is originally placed on the index finger because, according to ancient Jewish tradition, the right index finger was considered a more direct link to the heart than the left ring finger. When shopping for Jewish wedding bands & rings, a more economical option might be the traditional solid gold band. While solid gold might bring to mind 14 carat gold, there are also Jewish wedding bands in white gold available. As long as the rings you buy are solid gold with no breaks in the circle, your wedding band will be an appropriate symbol of your everlasting bond. 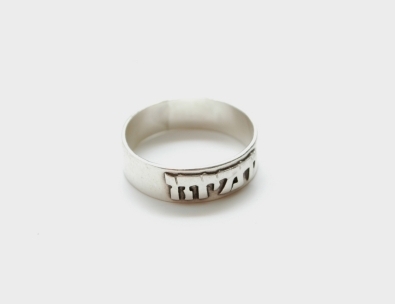 A popular phrase for women’s Jewish wedding bands is from the Book of Ruth: “ba’asher telchi elech,” which means “Whither thou goest, I shall go.” Rings can also be engraved with the couple’s names. Matching bands with the same engraved phrase on both rings are the most popular, but there are many options to choose from. There are even two tone rings with the Hebrew phrase engraved on a spinning white gold band on top of the unbroken 14 karat gold band. The two-tone spinning style provides a modern look with the traditional unbroken band. There are also Jewish wedding bands & rings with engraving on the inside or the edge of the band for a more contemporary style. These days, you don’t have to visit your local Jewish jewelry shop to find the perfect Jewish wedding bands & rings. The internet is a good place to begin looking at designs, metals, engravings, and prices. You can compare prices for popular styles and brands online and find the best deals. If you find a style you like online, you can also go to a physical shop with your ideas in mind. While wedding bands with Hebrew phrases engraved on them can cost from $400 to $600, there are more simple designs that cost less. You can find matched gold bands without engraving for as little as $200 for a set. Custom engraving of names usually costs more, but you can also buy plain gold wedding bands and get them engraved. The most overlooked aspect of wedding band purchases is the ring size. Because you will be wearing your wedding band every day, it’s very important to find the right size ring. Even though the ring is placed on the index finger during the ceremony, the wedding ring should fit the ring finger on the left hand for everyday wear. While you can find ring sizing on the internet, it is best to get your ring size at a jewelry shop. Many jewelers or jewelry retailers will find your ring size for free, so make sure and find your size before you shop.